Traditionally farming software has been combined with accounting software on farm. As rural broadband takes hold and accountants and advisors work closer with farmers to achieve better outcomes we believe a tightly integrated ‘best of breed’ approach is a better solution. Xero has worked with farming specialists and farming solution providers to determine a framework for tightly integrating farm management software and accounting to create a seamless approach for farm financial management. In addition a modern integrated Farm Management solution needs to be connected to rural banks and rural suppliers to automate the movement of financial information This document lays out the approach for Farm Software providers to connect their solutions into Xero to provide a seamless Farm Management experience for their customers and allow the powerful advisor community to assist Farmers. Integrating with Xero allows farm software to team up and deliver one complete online solution for farming in the cloud with real-time accurate information for stakeholders. A quick summary of benefits are listed below. There are many rural feeds and farm addons available to ease the collection or input of farm data. Contact us for more details. Full announcement of all farming partners who are ready to launch and demo at Xerocon in NZ (February 2014). Will also announce all farming partners (including rural feed partners) at this time. Here is our candidate model. We'd welcome your feedback. In summary the model is as follows. Farm Management software (FMS) will provide the subsidiary ledger and inventory system for livestock. Xero is the accounting software and only records the total livestock by type. The FMS understands births, deaths and aging of livestock information. From time to time the FMS will synchronize it’s ledger with the summary information held in the Xero. Xero can contain any number of Livestock asset accounts that will display on the Farms Balance Sheet. Some livestock information, such as livestock purchases or sales will be recorded in Xero and therefore need to be 'cleared' when a livestock reconciliation takes place. There are several options for coding these transactions. See the process flows below. The actual stock numbers are managed in the FMS system. The reconciliation process involves using the stock quantities in the FMS and the stock values from Xero then adding on the farm adjustments. At year end the FMS the livestock schedules are sent to Xero which can be displayed in the Annual Report. In the P&L setup Revenue/Expense accounts for each stock type. For a more detailed COA setup Revenue/Expense accounts for each stock type and class. Whichever option is selected it is up to the FMS to complete the correct reconciling journals at period end. Tracking- Farming entities which have multiple farms so they can run as separate departments linking to tracking values within Xero. See Tracking Categories. Contacts-Reconciling farm transactions using Contacts stored in Xero. See Contacts. (Optional) Sync chart of accounts and tracking to FMS. Sync live actuals and retrieve the budget summary report from Xero. In addition there are Connected Apps that can that can be used to provide easy input/breakdown of trading accounts directly into the FMS if needed. Sync to Xero for all (or farm accounts only) journals in period. 1. 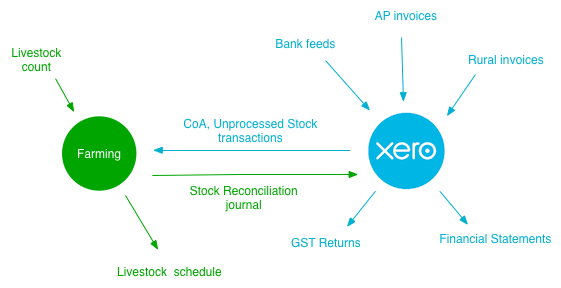 Reconcile [stock-unreconciled] from Xero for each stock type. 2. Revenue/Expense accounts for each stock type. 3. Revenue/Expense accounts for each stock type and class. Prepare Annual Reports. Contact us if you require further information on this. Add livestock schedules into Xero annual accounts. 1. In the P&L setup Revenue/Expense accounts for each stock type. 3. For a more detailed COA setup Revenue/Expense accounts for each stock type and class. In addition there are addons that can that can be used to provide easy input/breakdown of trading accounts directly into the FMS if needed. See Farm addons here . Contact us if you require further information on this. Our Accounting partners have given positive feedback on the design. It is important they can produce a livestock schedule and valuation for clients who have still not transitioned to the full solution. Having an entry level partner edition for the Connected Apps allows the Accountant to use the system for one-off annual work and will get them familiar with the product and allow them to grow their client base onto the full solution. Internet- Farmside has been widely adopted and the Government’s Rural Broadband Initiative is now available to many farms. Uptake has been slow, but as more solutions like this become available to farmers they will be able to justify cost. Banking 2.0- Xero is working with the major banks in New Zealand to complete the loop between the bank and Xero. This will allow automatic provisioning of feeds and the ability for the Xero user to push batch payments directly into their online banking. Currently in Xero, farm organisations use inventory Items to track stock classes. Xero does not expect this practice to continue once they adopt an FMS Connected Apps. Instead the FMS system will become the subsidiary ledger/inventory system for farming with the primary interaction being the COA. Farming entities which have multiple farms run as separate departments need to link to tracking values within Xero.